UPDATE: The OnePlus 6 Avengers Infinity War Edition is now official, with the Chinese OEM officially unveiling it earlier today in India. The device will ship with 8GB of RAM and 256GB of internal storage, and pricing starts at $660. In regards to a release date, however, OnePlus is yet to confirm any dates. The upcoming OnePlus 6 Avengers: Infinity War Edition has leaked out in official renders. 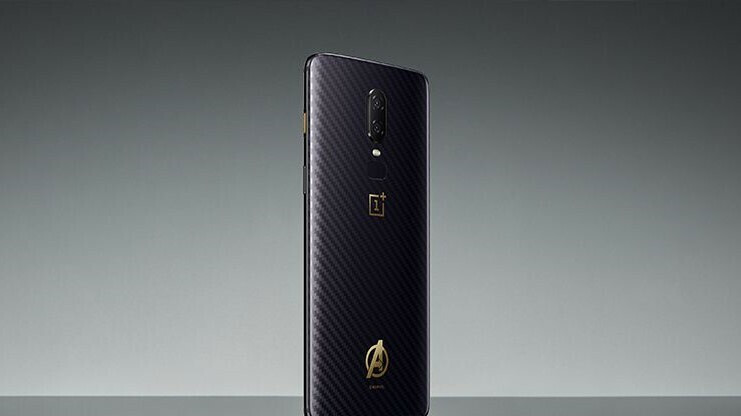 Despite the OnePlus 6 being officially unveiled in London earlier today, the popular Chinese brand still has one other product up its sleeves, the limited-edition Avengers variant of the smartphone, currently set to be unveiled tomorrow. Thanks to one Twitter user, however, a render of the device has appeared ahead of time. Taking a look at the image in question, the front panel of the handset remains completely unchanged. This means a large 6.3-inch display is present alongside a small notch up top that is home to the selfie camera and an in-ear speaker. Turn the phone over, however, and it’s a completely different story. In the place of the glossy finish seen on the regular OnePlus 6 is a new carbon fiber-like design that appears to be embedded beneath the glass panel. Furthermore, the OnePlus branding is now prominently featured below the fingerprint scanner in a new gold color that is taken from the logo of the latest movie. Speaking of which, the Avengers logo itself also adorns the bottom of the rear panel in the same gold color. In addition to all of this, the touches of gold continue onto the device’s frame in the form of the traditional OnePlus Alert Slider that is featured on the right side of the smartphone. As one final detail, the limited edition OnePlus 6 will ship with a custom Avengers wallpaper. Aside from the design aspect of the product, high-end hardware will also be present. This means Qualcomm’s Snapdragon 845 will be on the inside alongside 8GB of RAM and 256GB of internal storage. Furthermore, a 16-megapixel camera will adorn the rear, coupled with a secondary 20-megapixel lens that enables portrait mode. Also, a 16-megapixel selfie shooter will be placed up front. In terms of pricing, nothing has been confirmed as of yet by OnePlus, but with the OnePlus 6 Avengers: Infinity War Limited Edition set to make its first official appearance tomorrow in India, it’s only a matter of time before all release details are confirmed. Again more kudos goes out to Jony Ive...Waiting on patent infringement cases within the near future. Ive may pass the bar to become a lawyer. Fans would buy it,if it wasn't over priced. 8/256GB and SD 845 for US$ 660 is overpriced for you? Find me another similarly specced phone released this year at this price. Then we will talk. Truly, the only things I currently seem to dislike about the phone are: Glass back Notch Back FPS No telephoto camera. Is the Avengers logo suppose to make the Notch better? You want the logo Instead of the notch on the front? What I don't like about their limited editions is they tend to sale them at a physical location, and it's normally only in one place, somewhere not everyone that wants it will have access to be able to buy it.